Namibia hunts are quite famous and well-known. People from all over the globe are discovering this "best kept hunting secret" in Africa. Trophy hunters are, unlike the common opinion, people who love and respect wild animals. To hunt trophies is living a whole experience. It is an encounter between a nature-lover and nature itself. Hunter and animal are engaged in a play. They compare their skills and expertise. In this the animal has the advantage of his natural habitat as home ground. During this play, you as hunter will be enriched by the messages you receive via your senses. What you hear, smell, feel and see in this African surrounding, is pure nature. The trophy you will take home with you, is the token of a life-changing experience (see our Hunting Pictures). Africa has many faces...a lot of opportunities...beautiful scenery...a lot of countries...a hunter's haven! And Namibia is one of the most politically stable, peaceful and democratic countries in Africa. Its beautiful contrasts and different tourist attractions, will make any visit or tour a memorable trip. The untamed wilderness of Namibia will help you to break free from the noise and stress of your everyday life and connect you to nature again. Namibia hunts can take place in different settings or regions. We know them all and visited all these regions. But still...the Kalahari is nearest to our hearts. And we will give you all the necessary info on hunting with us in the Kalahari of Namibia! Regarded as one of Africa's last wilderness areas, this undisturbed arid savanna will never fail to make you feel humble and part of nature. The diversity and cycles of the Kalahari region and its animals provide more valuable lessons than the highest educational institution. The large number of plants and animals entertain every appreciative visitor and hunter . For years of low rainfall, plants and animals are adapted and can survive in conditions that appears to us impossible.In years like this, one is reminded that all of mankind is dependent on the Creator of the universe for food, life and existence. 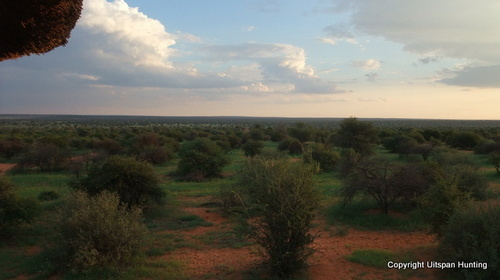 In years of good rainfall (read more on its climate) , the Kalahari changes into a paradise for man, plant and animal. All of nature suddenly seems to play and dance in colors and in activity. Then all of us "sing" together with nature and thank God for His grace, His love, His care. After an encounter with this wonderful land, one appreciates life, health, food, children, the peace and tranquility of the Kalahari, family, friends and much more. These are gifts from God. All of our family have been born and grown up in the Kalahari. We have learned to understand the animals and their special skills . We are passionate about our nature and wildlife and therefore we want to share this with special people. We know that hunting is not all about trophies. It's about those things in life that money can't buy. We offer you personal attention in a unique Kalahari setting of untouched nature. You will relive the joys of every satisfactory hunting day in our private accommodation facilities . It has a true African feeling...well...it IS AFRICA! At Uitspan Hunting Ranch we offer a variety of species that are typical and well known in the Kalahari. We know these animals and their qualities and customs by heart since we consider ourselves firstly as conservationists and then as hunters. As we have been here all our life, we want you to come and walk with us in the tracks of the first hunters, the Bushmen of the Kalahari, who perfected the art and skills of hunting. You can find answers for all your questions about travelling to Namibia, its currency, what to bring, visa requirements, etc. 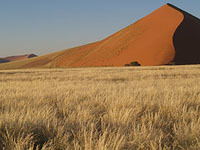 on our Namibia Travel Info-page. Contact us at Uitspan Ranch if you need more info about hunting with us.